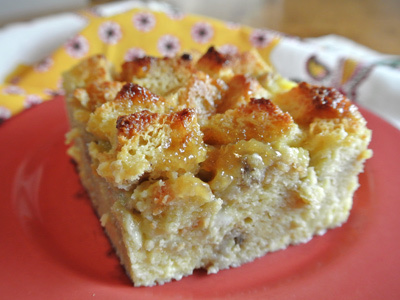 In honor of Fat Tuesday I’m celebrating with a big serving of warm banana bread pudding. I had a loaf of brioche bread that has been sitting around for a few days and some bananas that were starting to turn. The two seemed destined to come together to make a warm melt in your mouth dessert. Although, if you’re counting calories, this isn’t the dessert for you. It’s rich with cream and eggs and caramelized bananas in a buttery rum syrup. All things in moderation, right! To caramelize the bananas I assembled 3 bananas, 1/4 cup of brown sugar, 3 tablespoons butter and 3 tablespoons Rum. 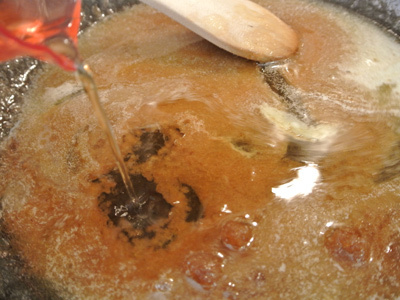 In a medium saucepan, melt the butter and brown sugar, then stir in the Rum. 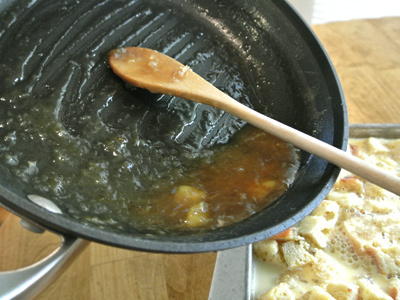 Bring to a boil, then add the banana slices and cook 3 – 4 minutes or until they are coated and begin to caramelize in the syrup. 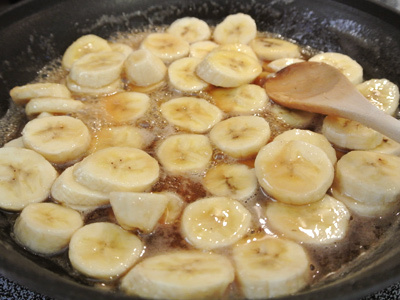 Remove the bananas with a slotted spoon and set aside the remaining syrup. 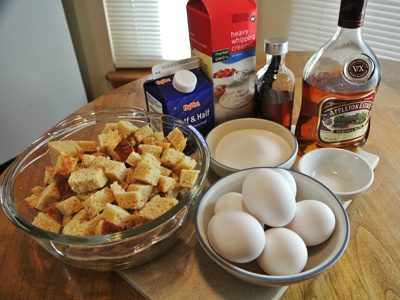 The bread pudding ingredients include 8 cups of stale brioche bread, 6 eggs, 3/4 cup sugar, 1/2 teaspoon salt, 1 1/2 cups each of heavy cream and half and half, 1 teaspoon vanilla and 3 tablespoons of Rum. 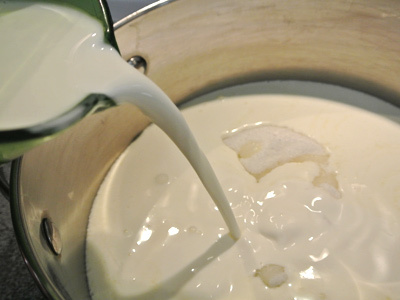 In a medium saucepan, heat the sugar, salt, heavy cream and half and half. Stir in about a teaspoon vanilla. Continue stirring the pot. Bring the mixture just to a boil, then remove from heat. Prep a 9 X 9 inch baking pan. Run a pat of butter over the bottom and sides of the pan. Sprinkle some sugar or vanilla sugar on the bottom of the pan. Add the bananas to the bread crumbs and gently stir them together. 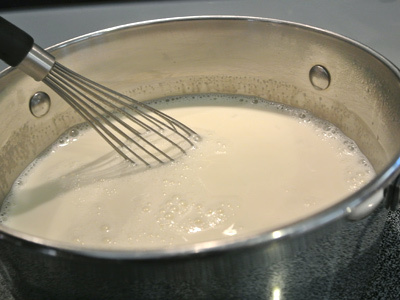 Pour the bread cubes and bananas into the bottom of the pan, then pour the egg and cream mixture over top. Spoon the reserved syrup over top of the bread and cream. Heat an oven to 350 degrees and cook 35 – 45 minutes or until toothpick tested. It comes out of the oven crisp on top with a warm banana flavored custard underneath. I sprinkled some bittersweet chocolate on top for Joe! To make the caramelized bananas, heat a medium saucepan and melt the butter and brown sugar. 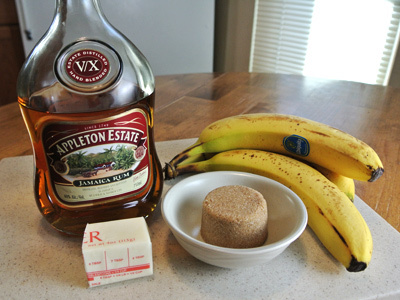 Stir in 3 tablespoons of Rum and bring to a boil. 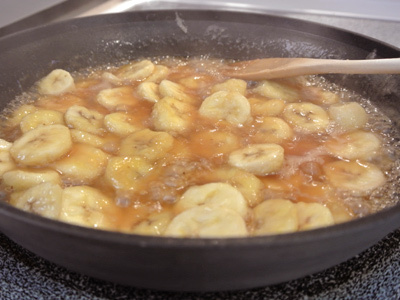 Add the sliced bananas and cook 3 – 4 minutes or until the bananas have caramelized in a thick syrup. Remove the bananas with a slotted spoon and set aside. Leave the remaining syrup for later. 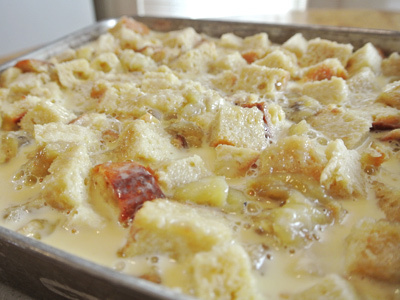 To make the bread pudding, combine the sugar, salt, heavy cream and half and half in a medium saucepan over medium heat. 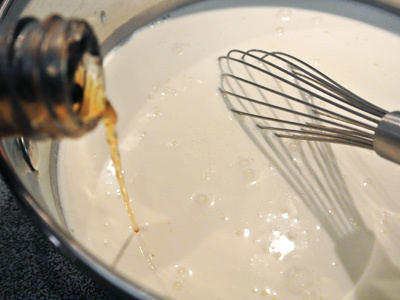 Add the vanilla and rum and continue stirring. When the mixture reaches a low boil, remove the pan from the heat. 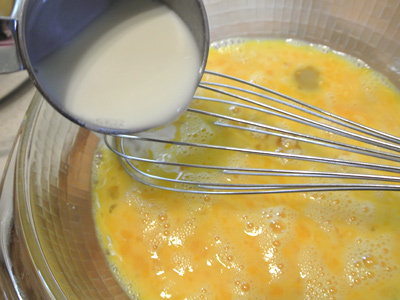 Add 1 cup of the liquid mixture to the beaten eggs all the while whisking. 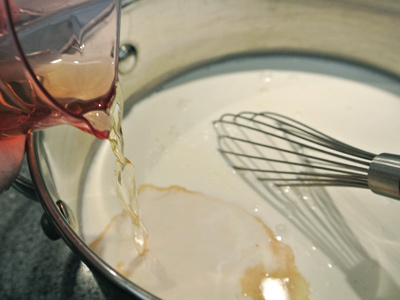 Continue adding a cup at a time of the liquid until all the liquid has been incorporated. Prep a 9 x 9 inch baking pan with butter over the bottom and sides of the pan. 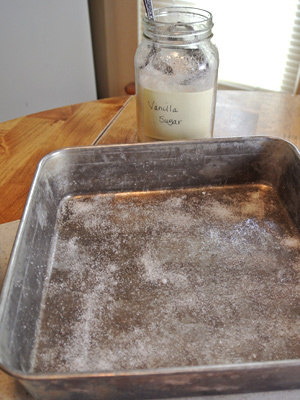 Sprinkle sugar or vanilla sugar on the bottom of the pan. 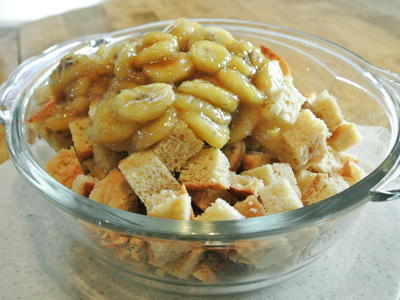 Mix together the bananas and bread cubes and spoon into the baking pan. 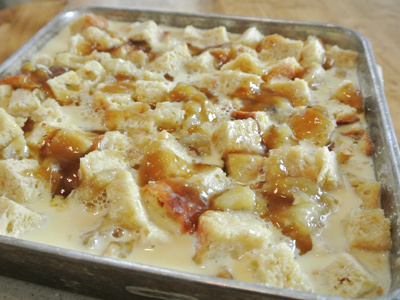 Pour the warm custard mixture over top of the bread cubes. Spoon the remaining syrup over top of the custard mixture. Bake in a 350 degree oven for 35 – 45 minutes or until toothpick tested. 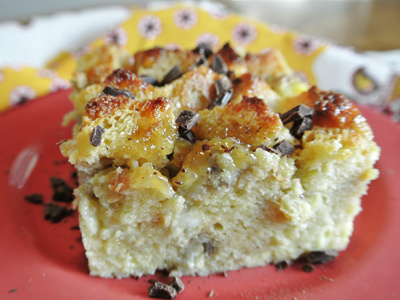 I love bread pudding! But never with bananas before. Will have to give this one a try. Yum! 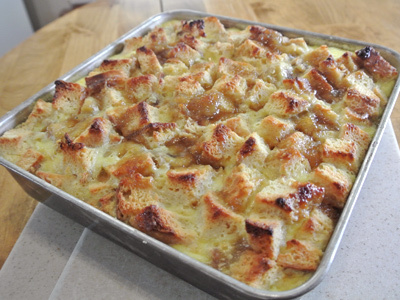 I had not tried bananas before either, but found it works really well in bread pudding! Tasted like a warm banana custard.